In canines, grinding the teeth can indicate pain, stress, or a more serious health issue -- which can lead to larger dental issues such as tooth fractures and infections. Take your dog to your veterinarian if he is displaying this behavior. A close-up of a man examining his dog's teeth. Canine teeth grinding, called bruxism, can have many causes: pain in the dog's mouth, abnormalities of the jaw, stress and anxiety, or even stomach pain. Regardless of the cause, the grinding can cause his tooth pulp to be exposed, leading to infections, and painful tooth and gum issues. A canine dentist or orthodontist can treat jaw abnormalities, extract painful teeth and address other oral or dental problems. 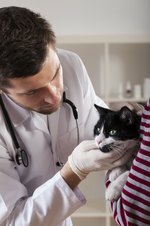 If an examination rules out these issues, your veterinarian can prescribe anti-anxiety drugs to treat anxiety, stress or abdominal issues.